FLAMMABLE BIOMASS of California vegetation measured in SEPTEMBER-OCTOBER. Redwood City, CA. 94064 (650) 325-7333 . Photo August 2009 along I-5 in Sacramento valley. 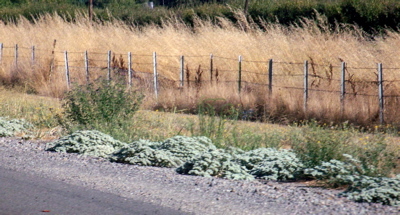 Gray plants in foreground are theTurkey mullein, and the green plants directly behind them, are gumplants, both produce zero burnable biomass in summer. Tall dry grasses are wild oats, equal to 500 gallons of gasoline per acre. N = Native and E = Exotic. Shade or sun aspect noted, and town for location of plants. N - Cal. poppy, sun, Palo Alto, one plant = 0.0 oz. or zero lbs. N - Gumplant sun Palo Alto, one plant = 0.0 oz. or zero lbs. N - Tarweed, white, sun Palo Alto, one plant = 0.0 oz. or zero lbs. N - Turkey mullein, sun, Stanford, one plant = 0.0 oz. or zero lbs. N - Koleria grass, sun, Palo Alto, 10 plants = 0.01 oz. or 28 lbs. N - Owls Clover, sun, Palo Alto, 20 plants = 0.01 oz. or 28 lbs. N - Coyote mint, sun, Palo Alto, one plant = 0.1 oz. or 270 lbs. N - Danthonia grass, sun, Woodside, 2 pl. = 0.1 oz. or 270 lbs. N - Purple Needlegrass sun Woodside, 3 pl. = 0.1 oz. or 270 lbs. N - Sitanion grass, sun, Palo Alto, one plant = 0.1 oz. or 270 lbs. --- Newspaper equivalent, a single sheet = 0.125 oz. or 335 lbs. N - Elymus glaucus, shade, mtn. ecotype, Palo Alto, 6 plants = 0.2 oz. or 537 lbs. N - Elymus glaucus, shade valley ecotype, Stanford, 2 plants = 0.4 oz. or 1,075 lbs. --- Gasoline equivalent = 1 oz. per square foot or 465 gallons or 2,700 lbs. E - Wild oats 2 feet tall sun Palo Alto, 72 stems = 1.2 oz. or 3,225 lbs. E - Harding grass 3 feet tall, sun Palo Alto, 32 stems = 2.4 oz. or 6,450 lbs.